Seven Flow – It’s a Kind of Magic for Your Ladle Bottom. At this point, Seven could tell you about the special chemical composition or granulometry of the product. This would explain the self-flowing behavior, but still not the real effects. While customers are initially impressed by the “magic” self-flowing behaviour of a material that seems dry, in the long run they are convinced by the technical advantages. The steel ladle bottom is one of the most crucial parts of the entire steel operation. Some of the most modern steel plants in the world have adopted Seven Flow for the steel ladle bottom. In a market traditionally dominated by bricks, this cutting-edge technology has shown its advantages in the recent years, getting more and more attention in the market. Especially the highly competitive and quality-oriented European steelmakers are constantly looking for an advantage in the setup of their steel ladle bottoms. A variety of ladles ranging from 8 to 400 tons capacity have been successfully supplied. Modern steel mills are nowadays under huge pressure to achieve highest quality products while minimizing time and respecting demanding budgets. Optimization is the leading factor, both in time and space – especially for steel ladle bottoms. Smooth, joint-free lining: Joint-free refractories substantially improve the safety during the steel ladle operation as they decrease the risk of leakage and infiltration into the lining. 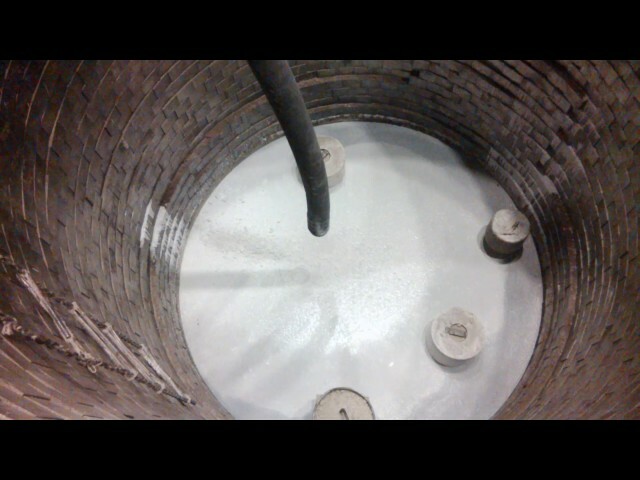 “Endless lining”: In contrast to traditional bricks which need to be completely exchanged at the end of the ladle campaign, an “endless” refractory layer can simply be replenished when needed. These smaller maintenance repairs only substitute which is necessary and can therefore result in substantial cost savings. Potential increase of ladle capacity: When the walls of a ladle are installed with magic flow instead of bricks, a thinner refractory layer is the result, thus increasing the inner volume of the ladle. Space is also an issue when you have to build thin refractory layers, to gain more productive space to be filled with steel instead. And cast after cast, day after day, the gained space means increased tonnage, lowered costs, better position in the market, and an increased competitive advantage. With a thinner refractory layer, steel preserves the temperature better, contains less non-metallic inclusions and avoids carbon pick-up. Thin refractory layers mean “self-flowing” materials. Where you can not apply vibrating materials easily, where anchoring is a barrier, or where you simply have to fill every available space. What if you simply cannot use a castable material? Only enjoy the material benefits and go with the flow alternative. Wide range of applications: from the safety lining of all steel mill vessels (ladles, tundish…) to their working lining, including covers, sealings elements, runners, etc… can be achieved with the help of Seven Flow. Chemical and physical strength: High resistance to steel and slag contact, compatibility with all the used covering powders, abrasion resistance, high mechanical strength, all coupled together with an enhanced ease of installation, make Seven self-flowing products the preferred all-round material for the modern steel plant. Seven provides suitable self-flowing materials thanks to its continuous research and innovation on formulation as well as raw material selection. The proper selection of granulometric spectrum and distribution, the correct identification of the suitable raw materials, in combination with synergic additives, gives Seven’s self-flowing material the same performance as standard castable or vibrating castable materials, but where these ones can not (or are not to) be used. We guarantee proper flowing properties, while respecting of all the required characteristics in terms of thermal, mechanical, physical needs.